"We have heard that you were a war criminal, used to wear dresses and eat discarded kitten claws. When was the last time you did any of that stuff?" As a journalist, I frequently used to face similar scenarios, where the person being interviewed would answer, "No comment." Every so often, I would put the "no comment" in the newspaper when I felt it was absolutely necessary. Regardless of what was in the newspaper, I normally knew the truth of a situation based on how the person would deliver his "no comment." A terse, angry "no comment" meant the person did what you were asking about, was angry at himself for doing it and was hoping the world would stop asking him about it. However, if the person said, "I know what you are referring to, and it's just not appropriate for me to answer those questions now," that could mean it didn't happen. 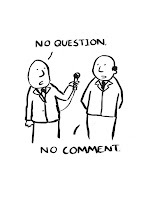 Some people are aware of the journalistic connotations connected to "no comment" and were at such a high level of interviewing, that they could make jokes about it. "Is it true you're dating Jeanie Buss?"